A former minister who served in the ANR Robinson cabinet during 1986 to 1991 revealed on Friday that four operatives of the US Central Intelligence Agency (CIA) and a troop of American soldiers were heavily involved during the Jamaat al Muslimeen attempted coup in July 1990 in moves to suppress the uprising. And he also said neighbouring Venezuela was readying itself to invade TT if this country could not quell the disturbance not merely to assist but to stave off a threat by Libya to its own sovereignty. Historian Brinsley Samaroo, who was minister of agriculture at the time, made the disclosures in a special television programme on CCN TV6 to mark the 28th anniversary of the event on Friday evening. Samaroo, who was a panellist, said that the Venezuelan president Carlos Andres Perez suspected that what was happening was an attempt by Libyan president Muammar Gaddafi to take control of Trinidad through the Muslimeen and use here as a base for the invasion of Venezuela. Perez was said to have expressed concerns to the few members of the NAR cabinet who had escaped being taken hostage by the Jamaat whose members stormed a sitting of Parliament with their guns blazing. They were hold up in the parliamentary chamber for six days before being released on the signing of an amnesty granting immunity to the Jamaat. Prime minister Robinson and attorney general Selwyn Richardson were among the hostages in the Red House. Those who were on the outside and were not captured were either out of the country or did not attend that sitting. The hostages’ experience included being lined up for execution in the event the army and the police tried to storm the chamber. The stand-off also included the take-over of the national television station, TTT, and there were more than 20 hostages, including head of news Jones P Madeira and newscaster Dominic Kalipersad. Kalipersad yesterday produced a transcript of Samaroo’s presentation on the programme. Samaroo was in London attending a meeting when the attempted coup was staged. He was able to get a flight to Barbados where he met other TT officials including two other ministers, Ken Gordon and Bhoe Tewarie. Samaroo said while there a senior Barbados government official came to them for their reaction to a request by a Libyan plane to refuel in Barbados before heading to Trinidad. Samaroo said the TT officials suggested that such permission should not be given. “The US Ambassador at the time, Charles Gargano, must have gotten that information...and, so, he was with us at the Hilton almost on a 24-hour basis, advising us on what we should be doing. 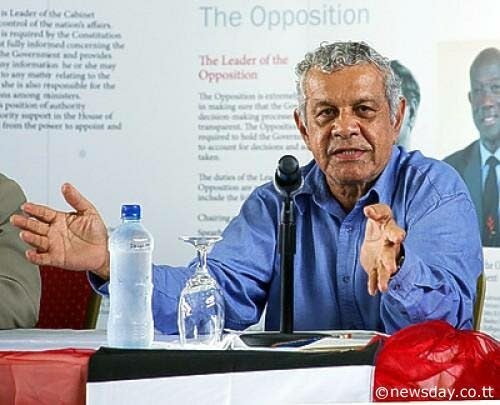 “I got the impression that he was there to forestall the Venezuelan initiative that he might have heard about,” Samaroo said. Samaroo spoke about the four-man CIA group who was constantly advising government officials on what should be done. One of the recommendations they made, according to Samaroo, was to starve both the hostage takers and the hostages as well. He said the four CIA advisers had long experience in dealing with hostage situations, and gave local officials continuous advice on what to do. Samaroo also revealed the US ambassador had arranged for a C130 transport plane to come from Puerto Rico with American soldiers and a tremendous amount of technical equipment. He said, “They put something (electronic equipment) up on the Clico building and, I don’t know how they got sound from the parliamentary chamber, so that we at the Hilton were getting both audio and video of what was happening, thanks to the Americans. Reply to "TT centre of ‘war’"